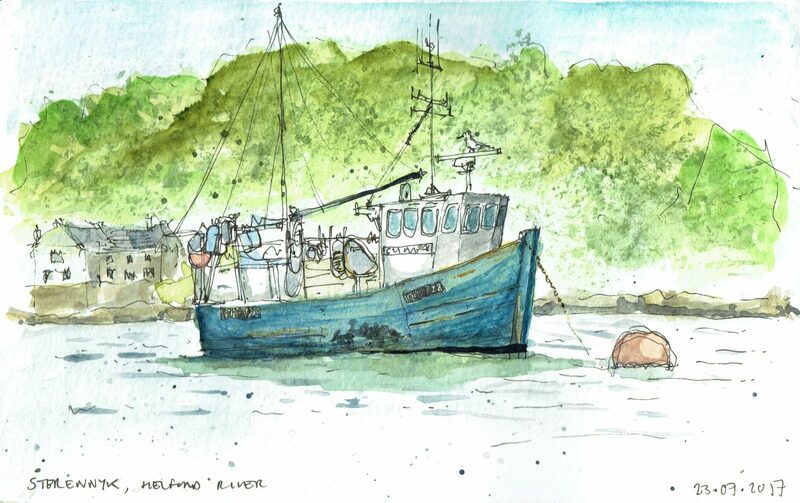 A typical Cornish fishing boat on the Helford River near Falmouth, Cornwall. Falmouth Maritime Museum is a frequent haunt for those Cornish holidays with just a bit too much summer rain, but you can’t fiegn disappointment about the weather in the face of such spectacular architecture. The museum is the focal point in the extensive redevelopment of shops, eateries and residential buildings where the link between dock and town has successfully captured the Cornwall town’s historical importance and its humble vernacular. Designed by Architects Mary Jane Long and Rolfe Kentish, the Museum’s lighthouse-like tower surveys both town and seas with rustic elegance, flanked on the town side with a sharp angled roofline reminiscent of a ship’s sail, while the square front is clad in both vertical and horizontal oak timbers. Inside the museum is an enormous gallery of boats hanging from the four-storey ceiling. Walkways, rather than stairs, connect the mezzanines from one side of the building to the other. These mezzanines hold exhibition space, a café, and two wonderful creative learning environments for children with interactive games. 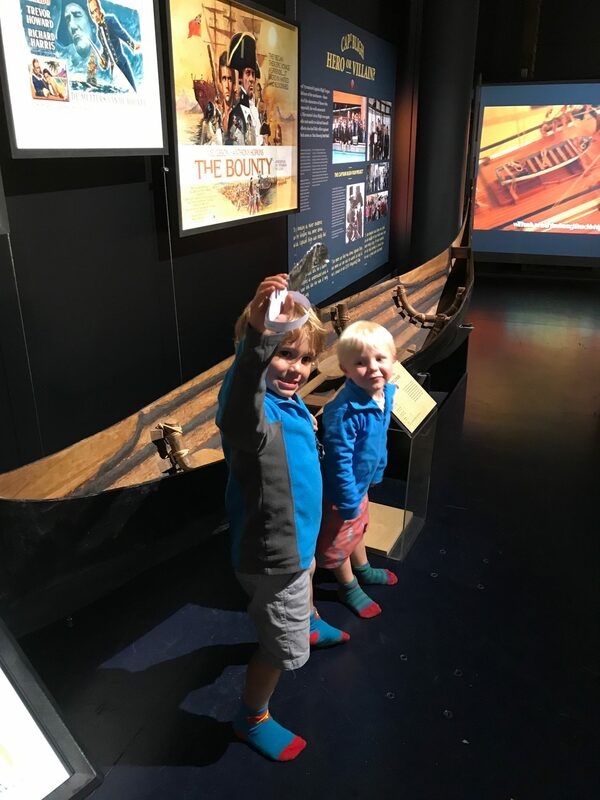 A strange fact about this visit to the maritime museum: Rob Hilton (founder of Hilton Barnfield Architects and born in the Solomon Islands) was reunited with the very same Solomon Island canoe his parents brought back from there in 1984. Stunning art-deco architecture brought back to life in Cornwall. Although we visited Penzance in the pouring rain, through the sheets of grey droplets, the Jubilee Pool still provided some architectural inspiration. The pool is triangular but with gentle curves and features steps within the pool itself. There are Cubist-style changing rooms and high walls to block any of the strong winds. The crystal clear blue water and painted changing cubicle doors really stood out against the grey Cornish sky on this overcast day. A great use of colour in architecture creating a stunning contrast to the white painted surfaces. Cornwall’s Art-Deco fresh seawater pool is 98.6 meters long and was built in 1935 to commemorate George V’s Silver Jubilee. 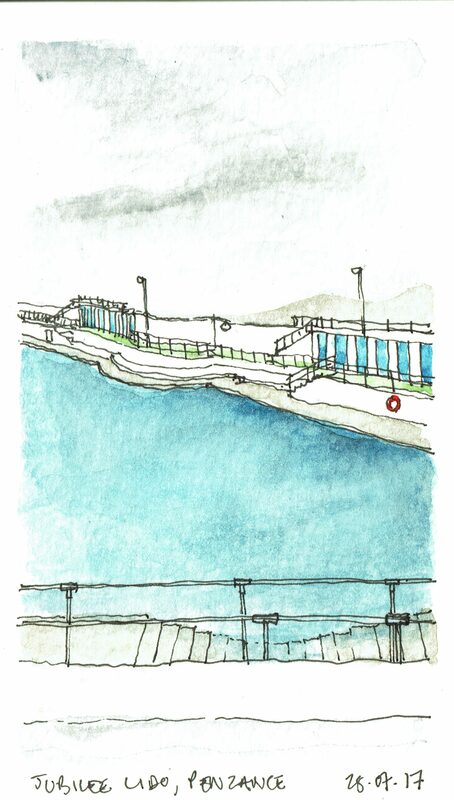 The storms of 2014 devastated the facility but a group of committed locals – Friends of Jubilee Pool – who championed the architectural renovations in this idyllic Cornish seaside town resulted in the reopening in May last year. The major engineering and refurbishment works involved saw Cormac and Cornwall Council pick up the ‘People’s Choice Award’ at the South West Civil Engineering Awards 2017.